Australian artist Kerry Holland, is based in Brisbane. 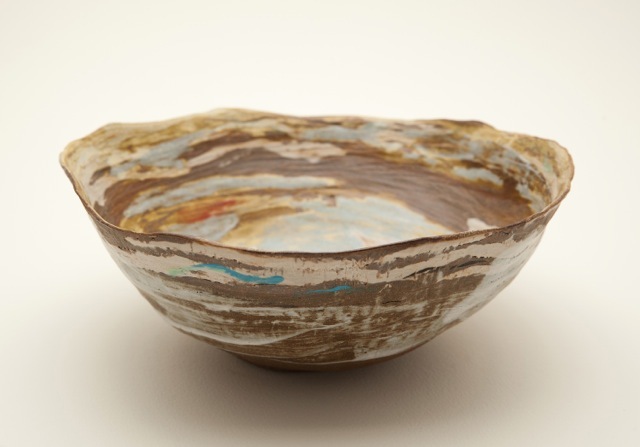 Her art works include contemporary symbolic abstract paintings, portraits and handbuilt ceramics. In some of her work Kerry has made use of painted crochet lace pattern as a metaphoric, textural language. Her colours are drawn from everyday life and imagination. Crochet lace, a craft both beautiful and commonplace, made usually by women for decoration or gift, has enormous potential for symbolic reference and Kerry has explored this in her art. Contributing to contemporary Australian religious art it has a voice that springs from the feminine story and her spirituality. finalist in the Mandorla Art Award, Fremanlte, W.A. 2010. The series of 11 paintings called Requiem/from death through to new life is now in the collection of St Ignatius College Riverview, Sydney, NSW. Exhibited in Brisbane St John's Cathedral, Ann St Brisbane in December 2007 and opened by David Busch (ABC Radio National, religious programs). 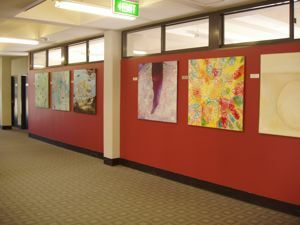 The series was first shown in Melbourne at the ACU Gallery June, 2007 and also jointly at Trinity College Melbourne University and Campion Centre for Ignatian Spirituality. Rosemary Crumlin rsm OAM opened this exhibition . 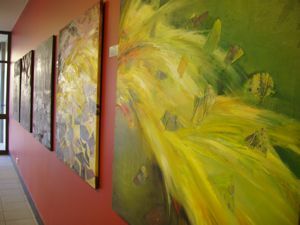 View the art work on this web site. click on Gallery above.